Executive Summary — Hugh Starr & Co., LLC. Kahuku Ranch is situated at the remote southern tip of the Hawaiian Islands’ Big Island of Hawai’i. Today’s Kahuku Ranch is the 655 acre Headquarters of the former 180,000-acre ‘Kahuku Ranch’ (est’d 1866). Kahuku is a wild place. Remote, yet still an accessible sanctuary in the midst of a gloriously open and sometimes rugged landscape. The Koa House is a natural Commons, and may serve as a Central Lodge. 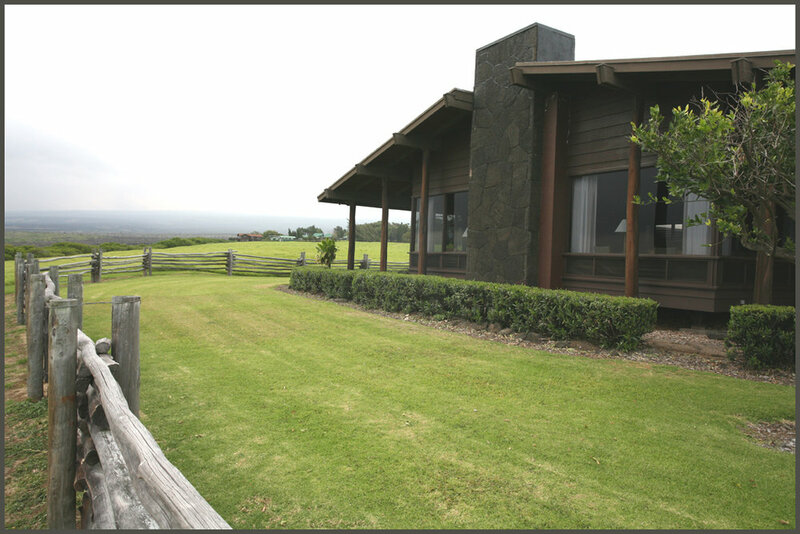 The Koa House showcases a large open common space shared with a generous natural lava rock fire place and 275 degeree view wide and deep over the free expanse of the Pacific Ocean, the rugged slopes of Mauna Loa and Kahuku’s green open pastures. It features sleeping accommodations for 14. Seven vintage Ranch Homes, each framed under traditional rooflines and well maintained. It is an intimate village-esque place and subtle reminder of former cherished times. Kahuku Ranch maintains immaculate and well-managed grazing lands. A stone's throw behind the Koa House sits the amazing open crater, Lua Pala Lauhala. A most fascinating natural feature, it has the potential to be utilized for intimate, quiet, special activities and celebrations. Perfect for retreats, meditation, dancing, night practices, and on. This truly unique formation allows the imagination to soar. Kahuku is a place of surprises: of solitude and respite, of sometimes intense Pacific tradewinds, of Hawaiʻi's fire and volcano goddess, Pele's primeval landscapes, of the astonishing lua (crater) habitats, of raw energy.